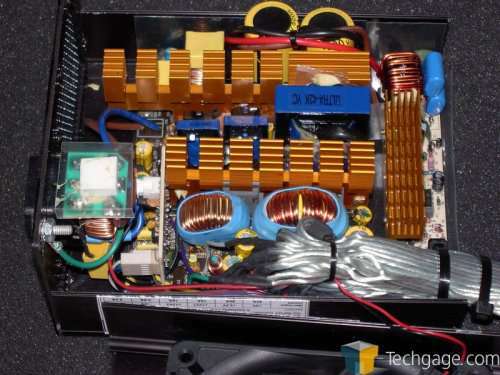 Looking at the front end of the PSU we get a better look at the APFC circuitry. Compared to power supplies I’ve seen with this circuitry built in it’s a bit simpler but since it’s basically supplying clean, corrected voltage to a non-PFC PSU I’d imagine that it’s level of complexity doesn’t need to be as great since it’s not serving as PFC and switch mode circuitry. Here’s a quick look at the power connectors. 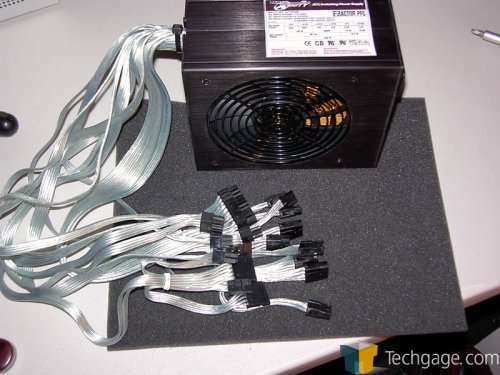 It has a 20+4 pin ATX, 4 pin ATX 12V, 8 pin ATX 12V, 8 (yes, 8) IDE 4 pin molexes, 2 – 4 pin floppies, 4 – 5 pin SATA’s and 2 PCI-e connectors. The options this gives you for drives, fans and other peripherals is simply astounding as is the number of cables this will force you to hide. Now that we’ve seen what it has to offer inside let’s see what it does hooked up. For loading I ran SuperPI v1.04, 3D Mark ’06 and Diskeeper 10 on both hdds concurrently. I was pretty impressed with the results. Like the X-Connect 2 I reviewed a while back the rail voltages were a bit high but not out of spec. Nothing to be concerned about by any means and under load the voltages remained pretty good. Overall I’m impressed with the performance. When it’s all said and done the Ultra X-Finity 500W with APFC is a solid PSU that gives a lot of flexibility for hooking up nearly anything that your heart desires. If you’ve got a ton of drives run your video card on 12V2 and you’ve got amperage to spare for drives. If you’re running a pair of power hungry PCI-e cards they aren’t choking on the same 12V rail. Quite a plus for what would be a budget PSU…if it wasn’t for the added cost the APFC adds to the pricetag. There are more powerful PSU’s out there for the same money but you stand to have your vid cards vying for power on an overloaded rail so it’s a toss up. Make sure that you’ve got plenty of room in your case as the 500 APFC takes up the same depth that the Duro 900 does. The added APFC circuitry has to live somewhere after all. The abundence of cables is both a plus and a minus. You’ve got plenty of options but then again you’ve got even more clutter to hide. I’d like to see Ultra rework an X-2 with APFC and the same rail topology so that users could have the added horsepower that the ability to tap both rails fully unleashes and have a slick modular interface. 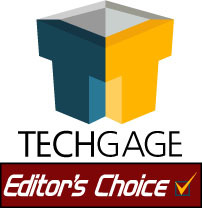 Overall I’m awarding the X-Finity 500W APFC a 9/10 and our editor’s choice award due to the forward thinking design.